What Wyatt’s Reading – March Edition | Still Life, With Cracker Crumbs.. This March we focused on bugs and springtime and Easter! We are getting ready for spring here, planning our garden, talking about bugs, learning about the changing of the seasons. Wyatt really loved Snail & Worm and Minerva Louse and the Colorful Eggs, which was really cute. He liked to compare his little toy chicken to Minerva Louise, because they look exactly alike. So we now have a toy chicken named Minerva. (interesting chicken facts- they talk to their chicks while they are in their eggs, and the chicks cheep back! Also, they can recognize up to 100 human and chicken faces!) My personal favorites from this stack were If You Plant a Seed (I must buy it!) and Snow Rabbit, Spring Rabbit. So cute. I really liked all of our books this month, but those were the standouts. And the entire Crinkleroot series is a must own now – my little bird boy loves this book, and I saw there are a bunch of Crinkleroot books that are guides for different outdoor things and birds, mammals, fish, etc that children should know. So it looks like Wyatt’s library is going to continue to grow rapidly! I didn’t know chickens were so smart! Wyatt’s posts always make me smile. I think reading to him would be so fun. Pingback: My Sunday-Monday Post! 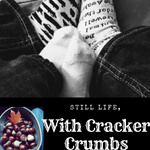 | Still Life, With Cracker Crumbs..
... a place for my book reviews, sharing the stuff I find inspiring, amusing or interesting.